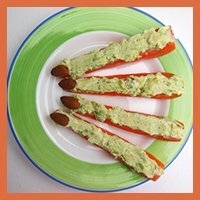 Using healthy recipes for kids as inspiration for quick, nutritious snacks to make a home has become a hobby of mine recently. 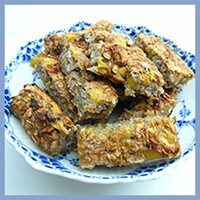 I really enjoy the thought of providing my son with some delicious treats that are easy to make, healthy and nutritious. And as an unexpected but much appreciated bonus: it has fuelled a wonderful food interest in my son. I have no idea how that expression has come about, but it designates someone who really loves food and everything about it: eating it, talking about it, preparing it etc. For him, food has become an exciting adventure in mixing tastes, colors and consistencies. Even though he is not as passionate about preparing it as he is eating it, (he takes from his mother, I suppose ), he is always looking forward to trying something new and even comes up with ideas and inspiration for new healthy non-sugary snacks himself. 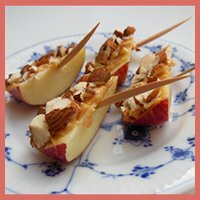 What I hope to do with this article on easy and simple healthy recipes for kids is to provide some ideas and tips for healthy kids snacks and to convey the message that healthy snacks for kids can be really, really simple with only a few ingredients (typically 2-5) and prepared in no time, a couple of minutes, tops. 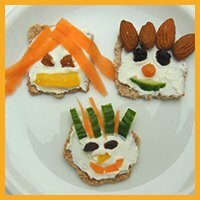 So with no further ado, here is a list of some nutritious quick snacks for kids. 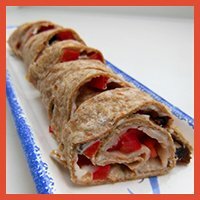 This example of healthy recipes for kids is a good demonstration of how quickly healthy snacks can be prepared and how amazingly few ingredients is required. Preparation time is only about a minute, maybe even less. And the number of ingredients is only 3: An apple, some peanut butter and a couple of nuts (here I've used pecan nuts). So all in all, it doesn't really get much easier than this. Cut the apple into slices or disks. 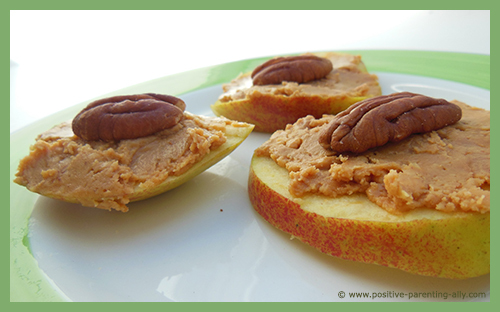 Spread a little peanut butter on to the slices of apple. Top with a couple of nuts. These healthy after school snacks are just as quick to make as they are delicious. 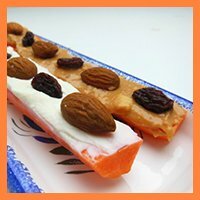 And just like what is the case in the simple snack recipe above, this one only contains 3 ingredients and together they make up a perfect blend of healthy fats, protein and carbs. 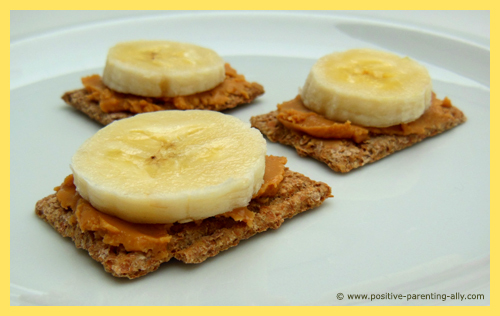 All you need is some whole grain crackers, a banana and some peanut butter. Spread some peanut butter onto the crackers. Top each one off with a slice of banana. This one of healthy recipes for kids takes a little longer to prepare. Primarily because of the time it takes to cut out the fruit. But even though time is little longer, it's still very, very easy. 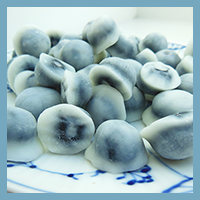 And you can also choose to make them in advance and stick them in the fridge for your kid to grab after school. All you need is fruit and vegetables and here there is no rule regarding type. Just choose whatever you feel like or whatever you kid loves. Here I have used melon, apple, pear, strawberries, apricots and a banana. Just cut the fruit out in nice sized chunks. Stick them on a kebab stick. Please, be aware that kebab sticks can be pointy and are unsuited for smaller children. In that case, you can choose to use chop sticks instead. Because they are thicker, putting the fruit on them can be a bit more laborious, but it's definitely doable. 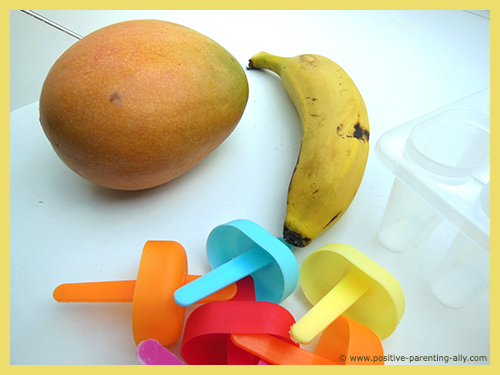 These delicious healthy summer snacks for kids are even simpler than the ones already shown, as they only contain ONE single ingredient, a mango. It doesn't have a mango, though, you can just as easily use a banana or a melon. 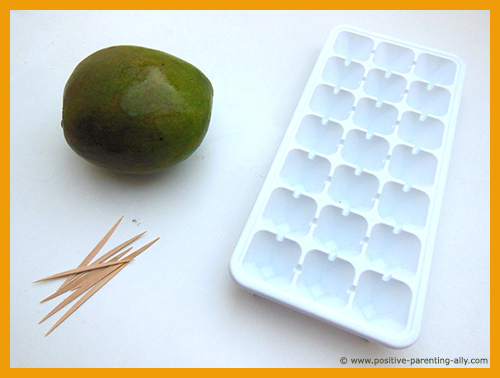 All you need is an ice cube tray, a mango and some tooth picks. 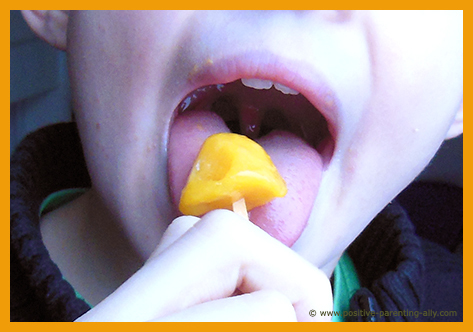 Fill out the ice cube tray with mango. 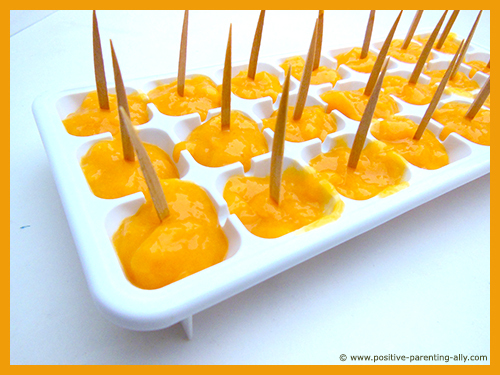 Put a tooth pick in each mango-filled hole in the ice cube tray. Once again, tooth picks can be pointy. Even though I have used some pointy wooden ones in the pictures below, I would choose some softer plastic versions for smaller kids. 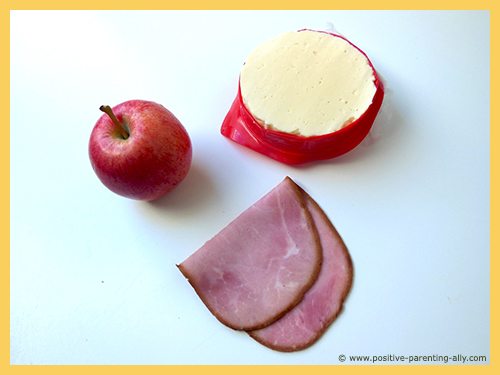 These easy snacks for kids are incredibly simple to make, and have a near perfect blend of carbs (apple), fat (cheese) and protein (ham and cheese). Cut the apple into wedges, the cheese into some rectangles that can fit on the side of an apple wedge, and the ham into long bands. 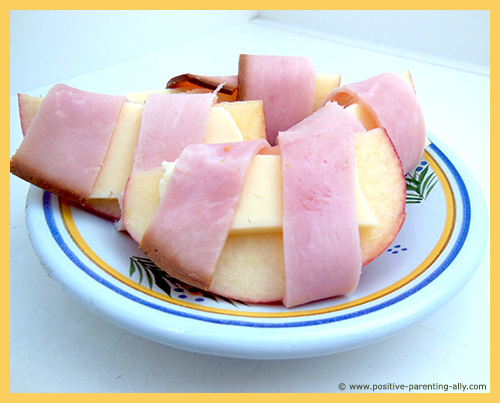 Place the cheese on one side of the apple wedge and wrap the ham around the two to hold them in place. 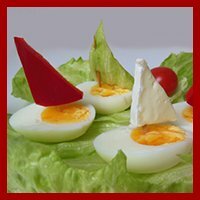 Here is another one of the easy healthy recipes for kids that is a near guarantee to be popular with any child. 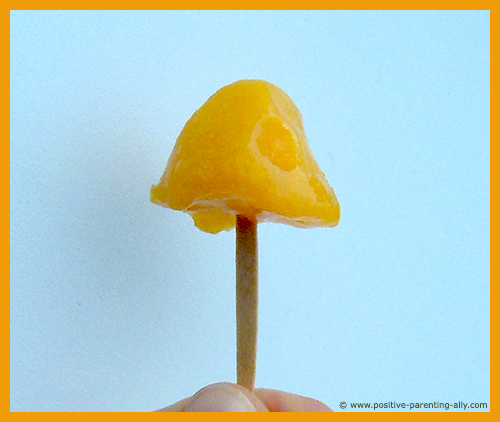 These fruit popsicles consist of pure fruit with no added sugar - so it doesn't really get any healthier than this. 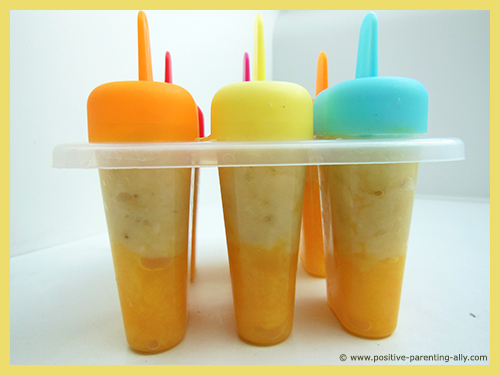 All you need is a banana and a mango and some popsicle forms. That's it. Peal the mango and the banana and mash them both separately. The riper the fruits, the easier the mashing. Put the popsicles in the freezer for 4-6 hours. 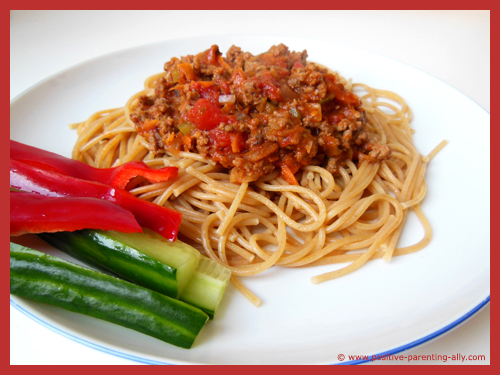 Spaghetti Bolognaise is typically one of the first real meal dishes parents let their children try to do by themselves. It's healthy, fairly simple and can't really go wrong, plus there is also lots of opportunities to let your kids be a little creative by adding a few experimental ingredients or spices of their own choice. Obviously, supervision will be needed to some extent, but this is a good way to give kids confidence in the kitchen. Measuring ingredients and reading recipes also helps them hone other skills, without it feeling like work. 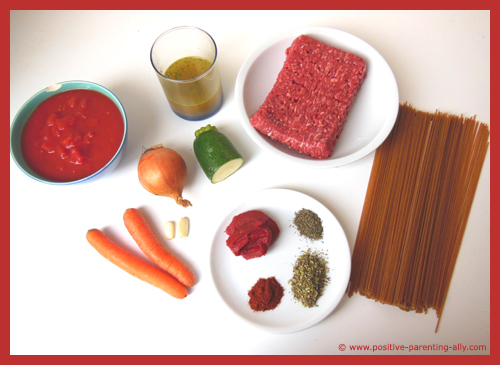 Here is my own recipe for a healthy Spaghetti Bolognaise for kids. Fry the beef until all redness has gone. Add finely chopped garlic and onion, and let them fry a bit before adding the finely chopped squash and carrots. Let it all fry for a little while. Once the spaghetti is cooked, put some spaghetti on each plate and top it off with some meat sauce. Sprinkle each serving with parmesan cheese and serve. Other healthy recipes for kids include baked meatballs, which uses the same ingredients as above but with e.g. a cup full of bulgur wheat added to the meat to help bind your meatballs. Your kids will love rolling the meatballs and baking them off in the oven for 20 minutes before adding to the tomato sauce will make an already healthy dish even healthier. 'What's For Dinner, Mum?' 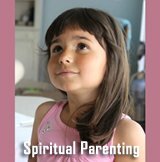 Most parents will be familiar with this question, which is usually asked by the kids as soon as they walk in through the door from school. Dinner is not only a chance for you to all meet up as a family to discuss the day's events, it is also a chance for you to introduce cooking to your children so they can be involved in the whole process. Before you invite your kids into the kitchen to help you cook, consider the tips below to ensure everything goes to plan. Age Appropriate Tasks - Even if the recipe you are cooking is a little more involved than usual, don't let this put you off letting younger children help you out. Toddlers make master mixers, but do make sure nothing is hot, and keep sharp utensils out of reach. Protection - Even the oldest of children can get messy in the kitchen, so ensure they have appropriate aprons to wear to protect their clothes. If you don't have aprons, you can use old clothes or even adult-sized shirts. Educate - Letting your children get hands on in the kitchen is a good way to educate them on healthy eating. 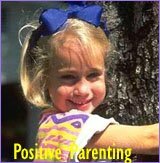 Healthy recipes for kids are much more interesting and enjoyable if the children have helped you make them. 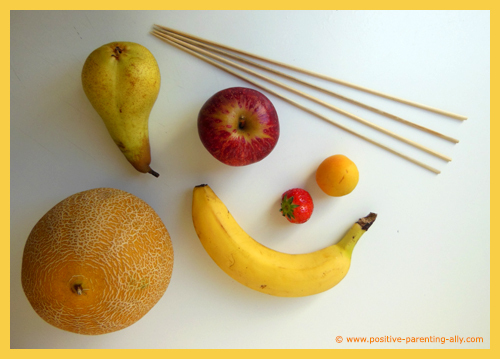 Encourage your children to ask questions and explain the different foods you are using and why it is good for them. You will find that cooking for kids is not just enjoyable for them when they are helping out, but also for you, as you get to spend quality time with them. Just don't worry about mess, that is inevitable when you mix cookery and children. If you want to get your kids interested in nutrition, you could try encouraging them to play kids cooking games to make the whole thing more fun. As one of the more basic cooking games for kids, this creative game is ideal for young and older children alike. Simply ask your kids to decorate their lunch box. If they don't have an 'official' lunch box you can use empty food containers. Explain that once the lunch boxes have been decorated, they will get to fill them with healthy easy snacks they can enjoy in the garden or local park. This one of kids cooking games is another that is good for all ages. Every child starts off with two slices of wholegrain bread. Then, from a selection of sliced meat, cheese, fruits and vegetables, it is up to the child to build their own tower sandwich. The golden rule of this game is the kids HAVE to eat the sandwich at the end of the game. This stops them from throwing a load of ingredients in to their sandwich for no reason other than to build the biggest one. This game teaches children about taste combinations, offers a good variety of fruit, as well as vegetables, and your children will learn that pear tastes nice with cheese or that apple complements pork. How much you include about nutrition in your games is entirely up to you. I hope you enjoyed the article on healthy recipes for kids and found something of inspiration to try at home. 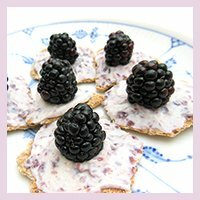 If you desire more healthy snacks inspiration, please have a go at some of my other snacks pages. 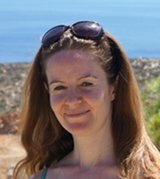 You will find links to those at the bottom of this page.